1899 built for Northern Steam Ship Company Limited. Proved unsatisfactory in service. 1904 sold to M. Walsh of Melbourne. 1914 sold to McIlwraith, McEacharn, Ltd., Melbourne. 1917 sold to E. Taylor, Melbourne. 1917 steam engines removed. A diesel engine was installed at some later stage in her career. 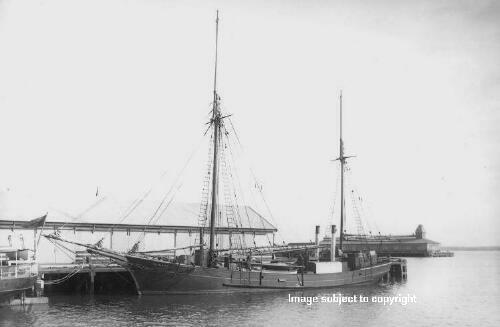 1923 sold to Yarram Shipping Co., Melbourne. 1927 sold to E.J. Wright, Melbourne. 1930 sold to I.S. Angelinavich, Melbourne, A.J. Coch, Melbourne. 1932 sold to W.G. Sims, Melbourne. 1941 sold to J.M. Angelin, Melbourne. 1947 sold to Roman Catholic Mission of New Guinea.